With an easy-to-use web based interface, any and every computer with an up-to-date web browser is ready to access TimeIPS. 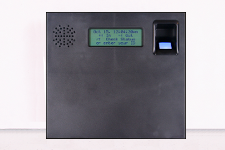 No special hardware is required, however TimeIPS offers walk-up clocks, badge readers, relay controls and other hardware you may wish to use. 30 minutes Telephone Support, valid for 1 year from date of purchase. For assistance in choosing the right system for your needs, please contact our sales department.